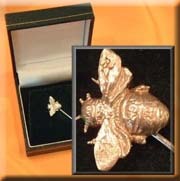 Sterling silver and 9ct gold jewellery gifts. Looking for an unusual jewellery gift then take a look at what we have to offer, the range includes handcrafted eagles, dogs, mushroom, cricket ball, pigs etc All items are individually hand crafted in our workshops and hallmarked at the world famous Sheffield assay office. If you can not see what you want then we can make it for you. bowler hat and wedding bonnet place card holders. 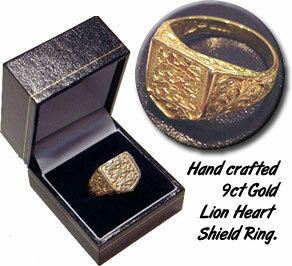 9ct Gold/Stirling Silver Limited Edition Lionheart Ring. Unique gifts has handcrafted the lionheart symbol and created a magnificent ring produced in 9ct gold or stirling silver. Bearing the world famous Sheffield Assay Office hallmark ensuring you of it's pedigree and quality. The Lionheart ring has been hand crafted in Sheffield and this is your chance to own a piece of British History and show you are a true England supporter.